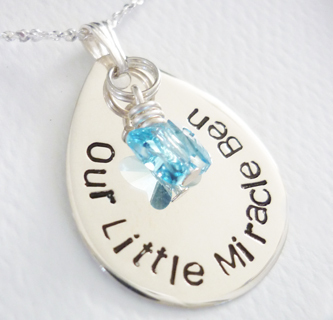 Such a perfect memorial necklace for precious angels held forever in our souls. This teardrop pendant features a delicate Swarovski butterly crystal, symbolising the return home of a beautiful spirit. Names and dates are usually stamped into the pendants, however you are not limited to this and if you have a favourite short motto or couple of words you’d like to wear close to your heart, we’ll endeavour to accommodate your request. A sterling silver chain completes a stunning, unique piece of keepsake jewellery.